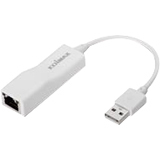 The Edimax EU-4208 USB 2.0 Fast Ethernet Adapter is specifically designed to give Fast Ethernet connectivity to your ultrabook, or any computer without an Ethernet port. Simply plug this Fast Ethernet adapter into a USB 2.0 port on your ultrabook, and you can instantly gain access to a stable 10/100Mbps Ethernet connection. The EU-4208 is also a quick and convenient way to add Ethernet connectivity to a desktop computer without the hassle of opening up the computer case. It is backward compatible with the USB 1.1 standard, and can function seamlessly with Microsoft Windows 2000/XP/Vista/7/8 and Mac OS 10.x.